Note: All language courses must be taken for a latter grade, without exception. Students may not take language courses for either R-Credit or Pass/Fail. 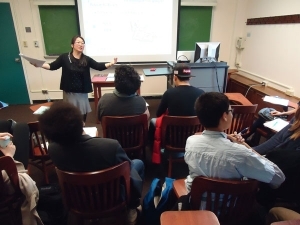 First-Year Japanese I & II: Introduction to basic Japanese language and culture. Students will become able to handle daily conversations, and read and write simple passages in hiragana, katakana and kanji. Second-Year Japanese I & II: Emphasis on writing, reading, and speaking in complex sentences and reading long passages. Aspects of Japanese culture will be introduced. Third-Year Japanese I & II: Focuses on accuracy and fluency in intermediate-level spoken and written communication. 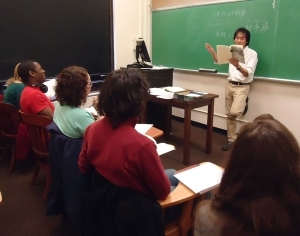 Hones ability to use intermediate/advanced-level vocabulary, expressions, and grammar and consider context when communicating in Japanese. Third-Year Japanese, Academic Reading: One section offered. Provides graduate students in Chinese and Korean studies with necessary skills for reading scholarly material. Focuses on mid-20th century to early 21st century texts. Fourth-Year Japanese I & II: Improves speaking, listening, reading, and writing skills. Develops ability to comprehend authentic materials such as academic articles, essays, short novels, and newspapers; and articulate opinions and detailed descriptions about abstract matters in speech and in writing. Fifth-Year Japanese I & II: Improves language ability from advanced to super-advanced. Serves as bridge between mastering Japanese and using it for analysis, research and literary criticism. Mandatory course for Ph.D. in Japanese studies. Your Japanese skills will be a valuable asset when you apply for jobs related to Japanese language and culture, such as language teaching and translating. Some graduates teach English in Japan through the Japan Exchange and Teaching Program, and others utilize their languages skills to conduct scholarly research on Japan. Together with your expertise, you may pursue numerous career options in fields such as business, law, engineering, journalism, and education.